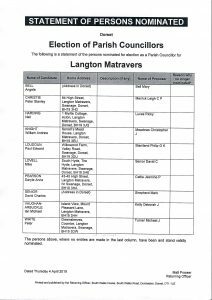 Langton Matravers Parish Council > Latest Parish Council News > Latest News > DEMOCRACY alive and well in Langton. Council Nominees – Vote on May 2nd. As we have 10 nominees, and only nine Councillors are needed, this means that we will be having an election as part of the elections on May 2nd. Please come and cast your votes for your preferred Councillors. Langton is one of the few Councils in this area having a contested election – we should feel proud to be part of such a dynamic community !